The Samsung Galaxy R I9103 stops a few paces from the top in Samsung's Android lineup, but you can tell that the R&D for the top dogs has trickled down the ranks. The camera quality when compared to other Galaxy models has definitely improved, if you exclude the lack of autofocus when shooting video. TouchWiz 4.0 is one of the most flexible Android modifications and the standard set of apps is quite complete - from the SNS-enabled phonebook, through the excellent video player and smooth 720p Flash video support to third party goodies like the very capable Polaris Office. Hardware-wise, it can’t exactly compete with the top dog in Samsung’s lineup, the S II, but it does better than many of the other Galaxy variants available, namely the Galaxy W. If you’re willing to forego the benefits of Tegra 2 and dual-core, the Samsung I9001 Galaxy S Plus costs about 20% less and comes with a (slightly smaller) 4-inch SuperAMOLED screen, as well as Gorilla Glass. If a Tegra 2 dual-core device is a must for you, then both the Optimus 2X and the Motorola Atrix will meet that need, with the Optimus having an 8MP camera capable of shooting 1080p video, and is about the same price. The Atrix has a higher resolution screen and is cheaper to boot. Neither can compete with the 4.2 inch screen size or 9.5mm thinness of the Galaxy R, but both come with Gorilla Glass. Or how about a Windows Phone handset? 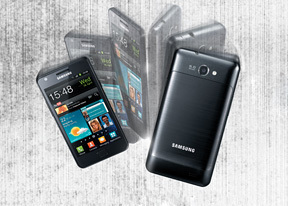 The Samsung Omnia W I8350 packs a better 3.7" screen than the Galaxy W - a SuperAMOLED. The Nokia Lumia 710 is also worth a look, it’s a bit cheaper and has a ClearBlack display and free voice-guided navigation to get you interested. The Samsung Galaxy R I9103 is a mixed bag of features—it has a nice 5MP camera, which produces nice and sharp images, but it does not feature the SuperAMOLED screen, the Gorilla Glass or the better performing Samsung Exynos chipset. Still, at the time of writing the difference between the Galaxy S II and the Galaxy R is about €100, which is no a small amount, so the Galaxy R would have a place of its own under the sun away from the shadow of the big gun.